I want to talk lashes. Lashes are important, when they are on point they add femininity to the eyes, make tired people look well rested and when we have things about our eye shape that we don't like, doing the right stuff to your lashes can completely change the eye shape. Let's start with the basics, having curled lashes will open the eyes significantly and make you look more awake. If you're already blessed with naturally curly lashes then you should thank your lucky stars. If not then you have probably struggled with lash curlers while trying to get use to them and perhaps even had an incident where you have ripped out some of the most precious hairs on your face, I have experienced this and it has been a major cause of anxiety for me. It lead to me simply refusing to use a traditional lash curler, those things are heinous. This isn't the first heated lash curler I've used and it is up there with the more affordable yet effective on the market. Essentially what you have here is a battery powered wand that heats up and allows you to curl your lashes the easy, quick and safe way. The wand only takes a minute to heat up and has protective strips that prevent the hottest part of the wand from touching your skin so it's very difficult to burn yourself. You simply turn it on, allow it to heat up for a minute and then press it against the base of your clean lashes, putting pressure in a slow, upward motion, this can be repeated multiple times for more stubborn lashes or you can simply hold the wand at the base of the lashes while pushing them up against your eyelid and keep it in place for a minute to help them curl, then simply drag the curler through the lengths of the lashes to finish them off. Once you have the desired effect just apply mascara and you're done! This product really surprised me but probably not in the way you would expect. This liquid liner claims 'fuller, thicker, longer looking lashes in 60 days', I used it every time I wore makeup for 9 weeks and I think the main thing people will want to know about this product is if it works or not. Personally I don't feel like I had any growth results while using the liner but I think it's important to point out that I used this product over layers of other eye products like primer and often multiple layers of eyeshadow, since this is a coloured product I only wore it on days when I was planning on wearing makeup and it was never applied to clean, completely naked skin, which in my experience is how these types of products perform best. But when I consider this products as just an eyeliner that's where it kicks goals, the brush is by far one of the best I have ever used that was provided with a product, 99% of the time I completely disregard brushes that come with gel or liquid liners and use my own because they tend to be rubbish, this one completely surprised me though, it has enough movement to work seamlessly with the contours of your lash line, holds together during application and doesn't splay so you can achieve a super thin line and sharp wing and holds the perfect amount of product so you'll never accidentally flood your lash line. As for the formula it's pretty spot on, mine is brown and I was concerned it would be a little too warm but it sets to a gray toned matte brown and doesn't budge! It's beautifully opaque so you won't need to apply multiple layers and it also comes in black for those who just can't compromise on a cat eye. This is a fantastic liner and the way it performs totally makes up for any disappointment on the lash growth front. I'll be picking up the black liner in the future simply because the formula and applicator are awesome. 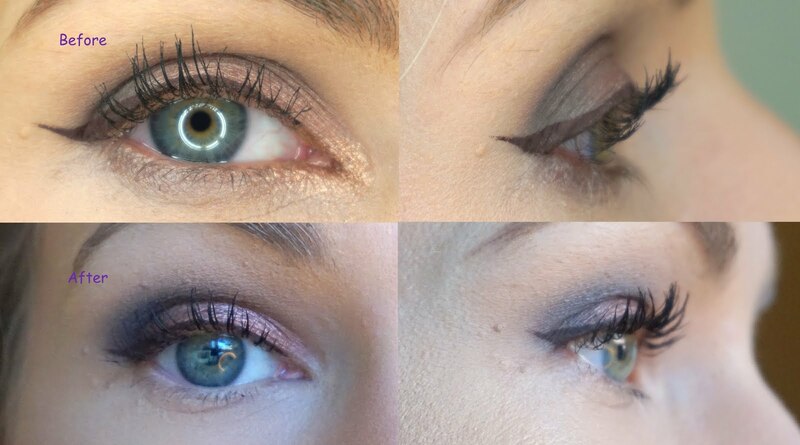 I really love individual lashes, you can probably tell because I ramble about this for a long time in the video and although I know these can be more difficult to apply in the early stages, once you have a technique down pat they are fool proof and look gorgeous! These lashes are no exception, they offer a beautiful fluttery effect that can be worn subtly or you can layer them for a more dramatic effect. These lashes come in three sizes, short (7mm), medium (9mm) and long (11mm), personally I think the 9mm are too long for standard wear and would always point people to the 7mm, I'd also love to see these in a 5mm for filling sparse areas on shorter lashes. As for their full bar lashes you simply can't go wrong. They are great quality, soft, flexible and come in many different styles to suit your personal preferences. I like to buy lashes that are symmetrical and cut them in half since my eyes are on the small side but if you have larger eyes you'll be able to wear anything from the range with no issues. The glue that is provided is latex free, has strong hold and dries clear and since it's latex free it doesn't stink! The little vial provided will last you a heck of a long time and the applicator is nice and thin so getting just the right amount on your lash band is easy without wasting product. When I use a pair of 1000 Hour lashes for a freelancing job I often give the client the glue as a 'just in case' fall back but I have yet to hear any complaints from crying brides and bridesmaids. 1000 Hour products can be purchased online at Priceline or in store nation wide.